Cambridge now has a brand new railway station that opened on the 21st May 2017 which is called 'Cambridge North'. This was my first visit and it was a very hot day. Cambridge North railway station is on the railway line from Cambridge to Ely as the names says is at the northern part of Cambridge. The station was opened on the 21st May 2017. The station is at Chesterton close to the Cambridge Science Park. The station is on part of the closed Chesterton Sidings site.There was a Chesterton railway station which closed in 1850 that was not to far away from the new Cambridge North station. The Cambridgeshire Guided Busway has an an interchange point at the new staion together with Park & Ride and other local bus services. There is a large car park at the station with 450 spaces. There is also space for 1,000 cycles. The station was only approved in December 2013 with construction work starting in July 2014. The station was often given the names of Chesterton or Chesterton Interchange, when it was first proposed. 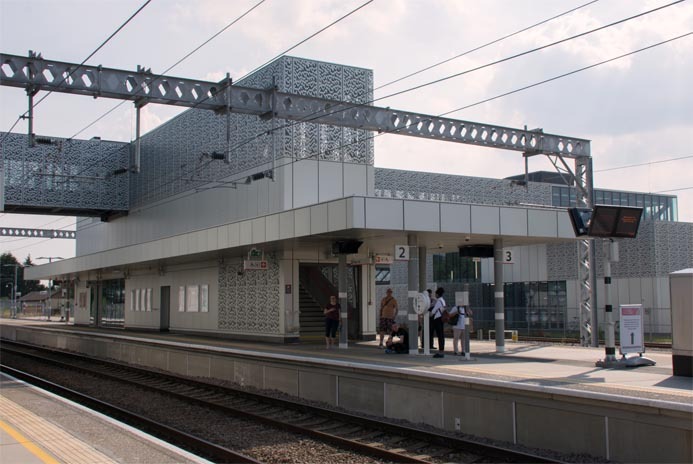 On 11 March 2015, councillors at Cambridgeshire County Council voted to recommend to Network Rail that from the list of 4 names above, that the new station should be called 'Cambridge North'. Cambridge North station looking north.The rear of the main entrance Building at Cambridge North is on the left . There are two goods line then Platform 3 the bay platform. platform 2 and 1 are the down and up lines. You have to use the footbridge to use all platforms.There are lifts and stairs. Building on platforms 2 and 3 at Cambridge North from platform 1 looking south. Cambridge North railway station has 3 platforms faces. Platform 1 is on the eastern side of the station and serves southbound fast services to Cambridge and London King's Cross. Platform 2 has northbound services to Ely Kings Lynn and Norwich. Platform 3 is a long bay platform. This bay can hold 12 coach trains for services to London Liverpool Street and Kings Cross. There are also 2 freight lines runing next to the bay platform. These had to be relaid to fit within the site.